Huesca - Huesca is a province of northern Spain, in the northern part of the autonomous community of Aragon. It is bordered by the provinces of Lleida, Zaragoza, and Navarra, and by France. Its capital is the city of Huesca. The monumental city is located at the foot of the Pyrenee mountain range, offering landscapes of incredible beauty. 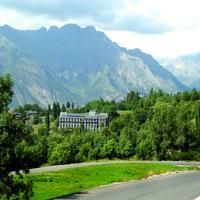 The surrounding mountains offer various activities in summer and winter. This modern hotel is centrally located in Huesca, minutes from Huesca Cathedral and Huesca Museum and is convenient to El Alcoraz Stadium. 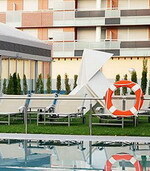 The hotel has many recreational amenities for guests, including an outdoor pool and fitness center. Additional amenities include complimentary wireless Internet access, babysitting/childcare, and shopping on site. Enjoy a meal at a restaurant, or stay in and take advantage of the hotel's room service (during limited hours). At the end of the day, relax with your favorite drink at a bar/lounge. 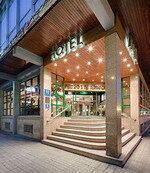 Located in Huesca, this modern hotel is minutes from Huesca Cathedral and close to Huesca Museum. This hotel is also within close proximity of El Alcoraz Stadium. The hotel has a seasonal outdoor pool. Enjoy a satisfying meal at the hotel's restaurant and at the end of the day, relax with your favorite drink at a bar/lounge. Featured amenities include a 24-hour front desk, multilingual staff, and laundry facilities. Event facilities at this hotel consist of banquet facilities and a meeting/conference room. Parking (subject to charges) is available onsite. Located at the foot of the ski runs in a privileged natural surroundings, this 5-storey hotel was extensively renovated in 2003 and comprises 12 single rooms and 112 double rooms. The Hotel Monte Alba offers an ideal and cosy atmosphere. Room facilities: Double rooms with twin beds, complete bathroom, telephone, safe box, heating, wireless internet throughout the hotel, TV. The Hotel offers a room for keep the skis and boots, lounge bar, reception 24 hours, T.V. room, terrace-solarium, heated swimming pool, kindergarten, sauna, laundry service, garden, children play ground, games room, physiotherapy service, children and adults entertainment programme. The region of Aragon can be found in northeastern Spain and comprises the provinces of Zaragosa, Huesca and Teruel. The region lies approximately with the historic kingdom of Aragon and is bounded to the north by France; the south by Valencia; the east by Catalonia and on the west by the regions of Castilla la Mancha, Castilla Leon, Navarre and La Rioja. The official spoken language in Aragon is Castilian Spanish, although in some of the valleys of the Pyrenees it is possible to hear the original language of Aragonese. Aragon is traversed by the river Ebro, which offers fish of such numbers and proportions that the Ebro is considered one of the best locations in Europe for Cat and Carp fishing. With a population of just over 1.3 million people living in Aragon, and half of them living in the capital city of Zaragoza, the region is mostly deserted with beautiful, mountainous scenery to the north, and mainly barren land in the south. The region of Aragon has three provinces whose capital cities Zaragoza, Huesca and Teruel take the same names as their province. There are many, small towns all across the region, and especially in the province of Teruel where out of the 236 municipalities, more than half the villages have a population of fewer than 200 people. In-between the villages the land is mostly deserted and quite barren. Zaragoza, capital of Aragon The huge Plaza del Pilar is the social centre of Zaragoza, looked over by some wonderful old monuments and fine fountains. Here can be found the Basílica del Pilar; whose domes and towers dominate the city and this is where legend has it the Virgin Mary appeared. To the west of the city centre can be found the La Aljaferia palace. An Islamic-fortress, it was once the residence of Arab kings and later by Christian kings, Aragonese kings and then by Spanish monarchs. Nowadays, the building houses Aragon's regional parliament. Declared a national park in 1918, an area of more than 15,600 hectares is now protected in the Biosphere Reserve or Ordesa as declared by UNESCO is 1997. Most of the park is limestone and a retreating glacier still exists on the north face of Monte Pedido, the third largest mountain in the Pyrenees. The park's dramatic mountain scenery comprises of limestone cliffs, canyons, caves, chasms and crystal-clear streams with forests of pine, birch, ash, willow and oak. Great birds fly the skies including the royal eagle, hawks, royal owls, ospreys and the snow partridge, while on the ground can be seen the marmot, wild boar, chamois and the red deer. The park is open all year round but the months between April and October offer the best conditions for walking and hiking.